7. Turn right on Wimberly Lane and proceed into the camp. 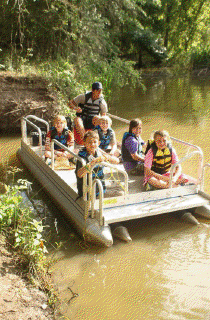 Carolina Creek offers over 30 different sports and outdoor adventure activities include everything from a high-speed 1000 ft. zip line to a slow-paced canoe trip down our 4 1/2 mile Carolina Creek. Details on our ball sports, low rope elements, high rope elements, outdoor adventure activities, waterfronts (including our “Blobs”), and summertime banana boating and tubing are listed below. Low ropes elements help small groups or teams learn how to effectively solve problems together as a team. These elements enable participants to develop critical thinking skills, communication skills, problem solving skills, trust, perseverance, corporation skills, and teamwork. These skills will help participants be more successful in group situations not only right now, but in the future as they pursue their chosen field of endeavor. At the end of each element, our trained staff takes time to help the participants learn how to apply what they have learned to real life situations and integrate spiritual application to their everyday life situations. 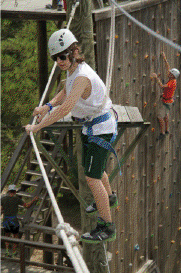 self-confidence and overcome fears. Learning how to set individual goals and achieve them is another one of the benefits of the high elements. Some high elements are even done in a pair which helps participants develop trust, accountability, and dependence on one another. The Carolina creek Waterfront includes a variety of ways to stay cool! Whether it is the 100 foot waterslide, the trapeze that reminds you of the circus acrobats, or everyone’s favorite – the Blob you are in for fast sliding or high flying adventure! Whether you are into extreme adventure or merely a rope swing, canoeing, or even fishing our waterfront is the place for you! 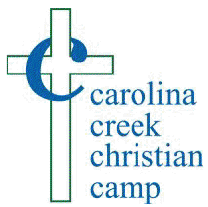 You will not want to miss the boating opportunites at Carolina Creek! Where else do you have a four and a half mile creek (Carolina Creek), a 1,000-acre private lake (Thomas Lake), the Trinity River, and even Lake Livingston right at your door step? 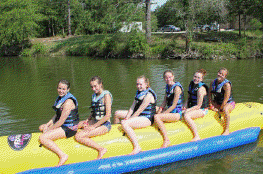 Our Ski Nautiques are waiting to take you and your friends on our Banana Boats and Tubes! We will see you on the water! 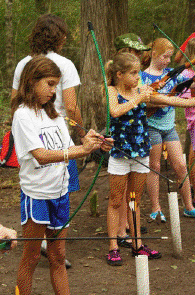 Can you go to archery, riflery, and canoeing in your back yard? That's why you need to come to Carolina Creek and learn some new skills for the very first time or further develop the skills that you already have. Basketball, Volleyball, Football, Baseball, Softball, Soccer, Ultimate Frisbee, and Frisbee Golf all mean fun for you and your team.